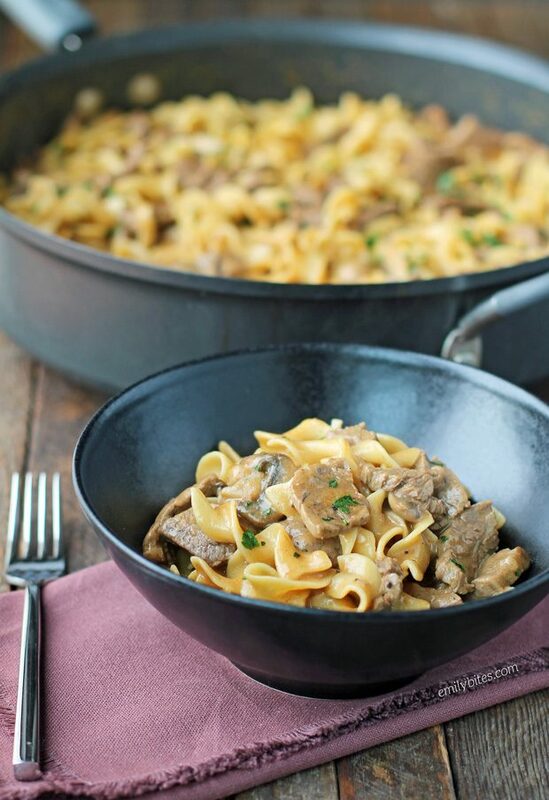 This decadent, lightened up one-pot Beef Stroganoff is the definition of comfort food. A rich, creamy sauce with tender slices of flank steak, egg noodles and mushrooms, it’s the perfect dish moving into these colder months. And did I mention it’s all made in one pot? So easy and less dishes – sign me up! Plus a satisfying serving is just 397 calories or 9 Weight Watchers SmartPoints. This dish tastes super indulgent and you’ll never guess from the flavor that it’s lightened up. I used mushrooms in this recipe to share it with you all because it’s traditional, I personally think they’re delicious in stroganoff and mushrooms are a great way to bulk up a meal and make it more filling, but since Mr. Bites hates them I picked them all out of his. If you’re a mushroom hater like he is you can omit them without issue. I also recommend using high quality paprika for this dish (I used sweet paprika) if you’re able, it gives it a flavor boost! On a personal note, my husband lost a close friend this week in a terrible accident and it has been really hard on him. 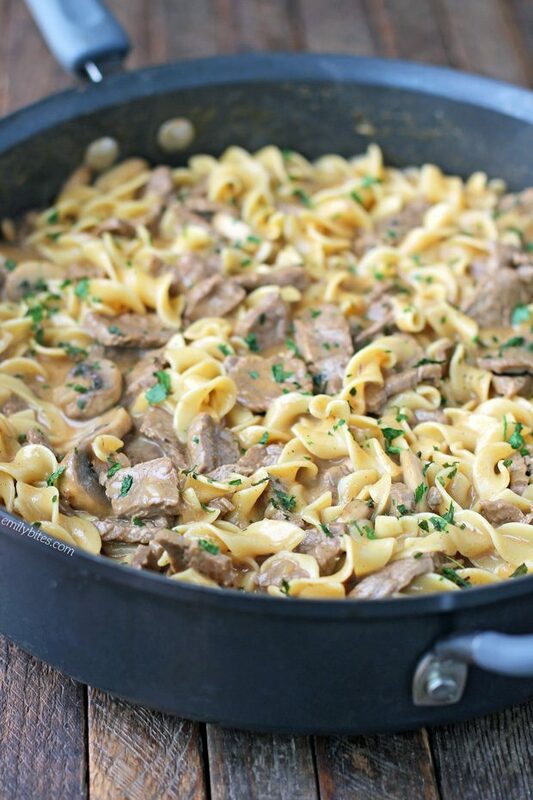 I’ve been trying to make his life as easy and comforting as possible when he gets home from work and Beef Stroganoff has always been a favorite of his. I want to dedicate this dish to my husband’s friend Tim and to all those who loved him and could use some comfort right now in their time of grief. You’re in my heart and constant thoughts. Looking for more lightened up comfort food pasta dishes? Check out the pasta section of my recipe index for favorites like Beefy American Goulash, Slow Cooker Kickin’ Chicken Pasta, Beef and Sausage Manicotti, Pumpkin Alfredo Tortellini Skillet, Spinach and Artichoke Lasagna Roll Ups, Chicken Cordon Bleu Pasta Bake, Tomato Soup Mac & Cheese, Spaghetti Pie, Sausage Tortellini Skillet, Buffalo Chicken Lasagna Roll Ups, Chicken Parmesan Stuffed Shells, Spicy Sausage Pasta and many more! In a large saute pan or pot, bring the butter over medium heat until melted. Add the sliced mushrooms and stir to coat. Cook for about 5 minutes until the mushrooms are softened and then sprinkle with salt and pepper. Remove the mushrooms to a side plate and return the pan to the burner. Add the canola oil to the pan and bring them to medium heat. Add the onions and stir to coat. Cook the onions, stirring occasionally, for 3-5 minutes until translucent and fragrant. Add the garlic, stir, and then cook for another 30-60 seconds. Add the sliced steak to the pan and stir. Sprinkle the steak with salt and pepper. Cook the steak, stirring occasionally until just browned through, about 6-8 minutes. Sprinkle the paprika over the beef and then stir together until the beef is well coated. Add the broth to the pan and turn up the heat to bring the broth to a strong simmer. Once simmering, add the egg noodles, reduce the heat to medium-low and cover the pan. Simmer for 7-8 minutes until the noodles are cooked. While the noodles are cooking, combine the corn starch and water in a small dish and stir together until the corn starch is dissolved. When the noodles are cooked, remove the lid from the pan and add the corn starch slurry. Stir the slurry into the broth and allow to cook uncovered for a few more minutes until the sauce is thickened. Remove the pan from heat and stir in the reserved mushrooms and the sour cream. Sprinkle with parsley and serve. I’m very sorry for your loss, Emily. So sorry for both you and your husband. On a practical note, I love your recipes but wish the print-friendly page did not include all those unnecessary photos. All that extra paper! I’m honestly not sure what you mean. Are you clicking the little yellow printer circle to the right of the recipe? When I go to the print friendly version there’s only one tiny little picture and it’s to the side so it doesn’t take up any extra paper. I’m sorry you’re having this experience but I’m not sure how to replicate it! You are an amazing woman! Thanks for all you share. When I first looked at the recipe picture, I thought FATTENING and you PROVED me wrong!!! Thank you! Emily:I know how your husband must be feeling, and I’m very sorry. My best friend was involved in a horrific auto accident 2 yrs. ago, when she was driving home from my house….after spending the weekend with me. She passed away without any time to say goodbye…. I miss her every day! Moving On…. Your recipe for “Beef Stroganoff” sounds great. It’s nice to know that someone (other than myself) still appreciates good old fashioned dishes. Thanks. Thank you Angelina. I’m so sorry to hear about your best friend, that must be so difficult. Sending some love back your way. So deeply, deeply sorry for the loss of your husband’s friend. Simply horrific. Sending (((hugs)))) So terribly sorry. This recipe is a wonderful tribute, cannot wait to try it. This is tracking 2 pets higher on the ww app as well. Do you know if there have been any changes recently? It tracks as 9 SP per serving when I run the ingredients through the ww recipe builder! So sorry for your loss. My prayers go out to your family. 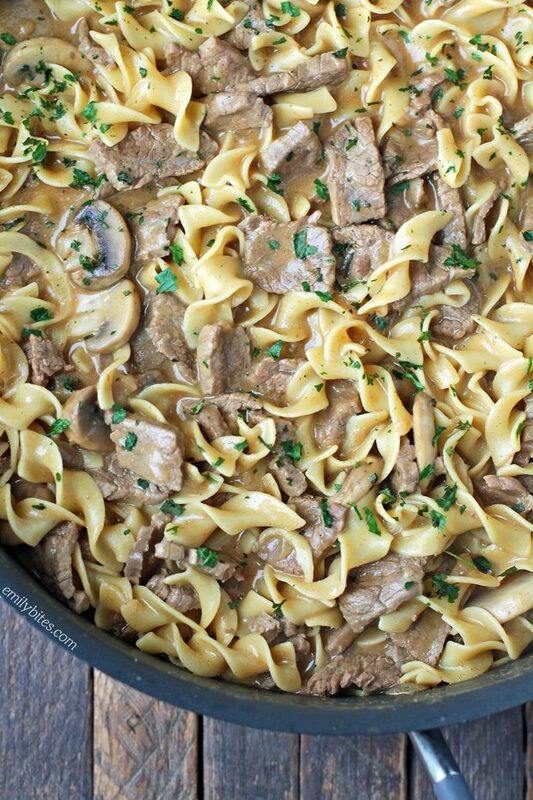 On a lighter note this beef stroganoff looks delicious and I had set meat out to thaw for diner tomorrow and wasn’t sure what to make but now I have something I think the whole family will enjoy. Thanks so much, I’ll report back and let u know how they like it, especially my picky husband. Thank you Kathy. I hope it’s a hit! I made this yesterday to eat for lunch this week. I used lean ground beef instead of the flank steak and omitted the mushrooms (just my preferences) and it is incredible. Thank you for all your good recipes- they have made a big difference on my Weight Watchers journey. How do you figure out the severing sizes for a recipes. Hi Emily, do you think London broil could be used in place of flank steak in this recipe? Have loved all your recipes I’ve tried so far! Have some London broil on sale at store this week would love to make this. Thanks! I want to make this tonight but can I use Al Dente Carba Nada Fettucine pasta instead to lower the points even more??? Hi Michele, I’ve never used that brand of pasta so I really can’t say for sure. Feel free to give it a shot and let me know! The flavors were good. I must have done something wrong because I needed like double the pasta, double the sour cream and triple the corn starch to have it remotely resemble what you made. Made this for dinner last week as we were running out the door to see Moana at a bring-you-own picnic dinner. Everyone was jealous because it smelled so good! And it tasted even better. I love that it came together so quickly and was super filling. Will definitely make again! But I’m still making it! Lol. The WW recipe builder does not count the values of zero point foods, though they obviously still have calories, etc. The WW recipe builder and MFP calculations do not always match! For further info feel free to check out my FAQs or run it through the recipe builder with the ingredients you are using. Hope you enjoy it! Did you use regular egg noodles or no yolk egg noodles? I’m curious if the no yolk will bring the smart points value down. Any idea? If I made this with ground turkey instead of beef how many smart points do u think it would be? I only have the points calculated for the recipe as I presented it so if you’d like to make changes to my recipe you will have to run the ingredients you use through the recipe builder on the Weight Watchers website. Enjoy!